Several “newcomers” and a handful of indie stars make up The Matinee ’18 August 16th edition. 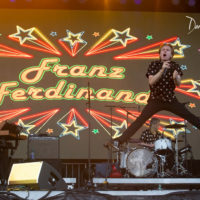 There are rockers, there are some cosmic dreams, and there is some upbeat pop fare. 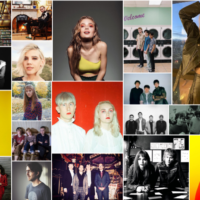 We’re positive you’ll find a new band to love in this mini-playlist. There is no shortage of great bands from the city of Gothenburg. No, we’re not talking about Ace of Base nor Little Dragon, but indie groups like Makthaverskan, Agent Blå, and Pale Honey. 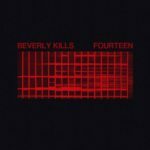 The latest arrival in this underrated city’s music scene is Beverly Kills, who last week released their debut single. If you trust in First Impressions, like we do, then “Fourteen” will make you believe they are Sweden’s next great band. “Fourteen” is a wave of euphoric exhilaration. Brooding post-punk fuse with with melodic dark-pop to form a song that sounds like the perfect, stormy marriage of Eagulls and YONAKA. The throbbing bass line and crushing drums are the thunder while the lingering guitar and blustery synths slice through the darkness and illuminate the air. Front woman Alma’s soaring vocals, however, explode loudest. With the gripping power of The Joy Formidable’s Rhiannon Bryan, she tells a story of letting go and starting anew. Of moving on from our sadness and anyone who wishes to keep us imprisoned in their cell. In many ways, this is Alma, Viggo, John, and Hampus’ story of breaking free from the Gothenburg sound. For one song, they’ve most certainly have done that and then some. They are a band to watch indeed. If you’re at work right now, you might want to close the door because you might slightly embarrass yourself as your booty starts wiggling in the chair. Then again, invite all your co-workers into your little space and turn up the speakers and have an early office party. If you’re in your car, roll down the windows, blast this next tune, and be prepared for strangers to ask you what you’re spinning. 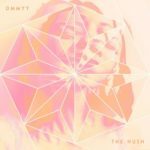 Then quickly reply, “The Hush”, which is the debut single from English duo DMMYY. 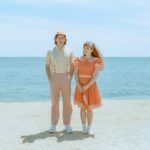 We really don’t know much about the pair other than that they hail from Brighton, and they’ve signed with boutique label Home Counties Records. We can only imagine that the two spent hours listening and dancing to their parents’ Sister Sledge, DEVO, and Deee-lite records. On the track itself, the production work is outstanding, combining the hallucinating ’70s disco sound with the exuberant pop of the ’80s. Yeah, the tune is a bit over-the-top, but everything done 30 and 40 years ago was. Plus, if it was subdue and subtle, it wouldn’t be fun and entertaining or worth bringing your friends and strangers together for one ultimate dance party. Now what do DMMYY have up their sleeves next? Hopefully when single two comes out, we’ll get to know who they are. 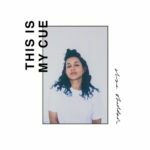 In the nearly three years when she first opened our minds with “Wars”, Eliza Shaddad has stolen our breaths, captivated us, and made our hearts skip a beat. And finally, the news we’ve been waiting to hear all year is finally official. Her long-awaited debut album, Future, will see the light of day on October 26th. She’s shared two songs already, and the third single is another one that is simply breathtaking. “This Is My Cue” perfectly illustrates Shaddad’s widescreen intimacy. The opening bass lines recalls The Cranberries’ brooding brilliance on No Need To Argue, but the comparisons don’t stop at the opening chords. Like the late Dolores O’Riordan, Shaddad embraces us with an unforgettable voice that wraps us whole and vulnerable lyrics that buckle our knees. 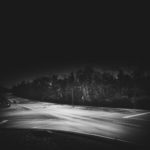 Her story about “seeking reason” and finding a way through the darkness and past the monsters is our own. It is one to which we all can relate. Yet no matter what path we follow, however, we must meet our inevitable end. For Shaddad, our end is stardom. Future will be released on Beatnik Creative. Remember to mark October 26th on your calendars. Twenty-three years ago, Pulp released their classic, “Common People”, which addressed the widening income gaps and increasing poverty in England. It was a political statement done through the guise of an anthemic rocker. 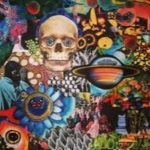 In their own way, Fucked Up tackle social inequality and societal misgivings through their fantasy-oriented storytelling. Anyone who has followed Fucked Up’s career know that their songs and stories center around Joyce Tops and her lover Lloyd, whose adventures are very real. Arguably the band’s most “realistic” song comes in the form of “Normal People”, which taken on its own could very well be “Common People’s” prequel. This just might be Fucked Up’s grandest moment. “Normal People” commences like a Nick Cave track before slowly turning into a raucous rocker that features the sextet’s trademark fiery intensity and catchy guitar licks. For good measure, there’s a little bit of saxophone just to give the track a little groovy element. This tune sounds outstanding with earphones, but it will be even more awesome live. Don’t forget to pay attention to the lyrics because they’ve once again crafted an awesome story about being an immensely small fish in an enormous pond and how our realities differ from what the elite try to tell us. Some of these realities (or inventive fantasies) are depicted in the outrageous video, which mixes together six vignettes to tell one poignant tale. 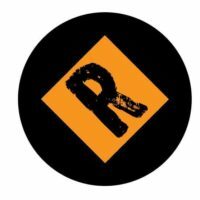 Damian Abraham, Jonah Falco, Mike Haliechuk, Ben Cook, Sandy Miranda, and Josh Zucker are Fucked Up. 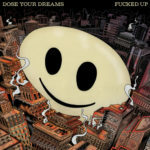 Their forthcoming double LP, Dose Your Dreams, hits stores on October 5th. Two outstanding labels, Arts & Crafts and Merge Records, will release it. We’ve long said that Vienna-born, LA-based Marlon Rabenreither is one of the most underrated singer-songwriters around. His musical style recalls the great rock ‘n roll of the ’70s and ’80s yet his stories are modern and refreshing. 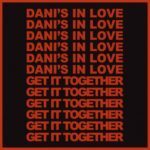 You just don’t find many artists like Rabenreither anymore, and he further separates himself from the pack with “Dani’s In Love”. Pre-order Uppers & Downers on Bandcamp. It could very well be one of the year’s standout records. Earlier this year, Holy Golden – the project of Leslie Schott and Andrew Valenti – released their stunning, debut full-length, Otherworld. It was a meticulously crafted and intimate record that at times felt like a fairy tale coming to life. The hard-working duo have more stories to share, as they will release their third effort – and second EP – within an 11-month time span. The lead single from Sleepwalkers In The Milky Way, which will be out October 26th on Wallflower Records, is another magnificent piece of art. A little less dreamy and less fantasy-oriented than the songs that comprised Otherworld, “Lost Island” is still dazzling. The song recalls the intimate pop-rock of the late ’70s and early ’80s. Echoes of Fleetwood Mac and, for more contemporary tastes, Sunflower Bean stream throughout thanks in large part to Valenti’s sublime, chiming guitar and Schott’s stirring vocals. Although the song’s title gives the image of a faraway, imaginary place, Schott beautifully uses “Lost Island” as a metaphor to articulate the many ways a person can feel lost and isolated. A couple of rowing out to sea, a person annihilated from the busy jungle that surrounds her, and one person being swallowed up by the waves are just three of the images she brilliantly describes. And in all three cases, each person has come to terms with their fate. which is depicted when Schott vulnerably sings, “Who cares anymore?”. In the case of Holy Golden, everyone should care and pay attention because they are going places. Good morning, good afternoon, and good night. 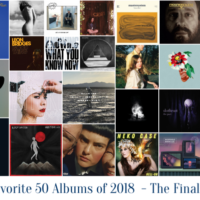 There are very few songs that would fit all three parts of the day, and those that do are considered classics (think The War On Drugs “An Ocean in Between the Waves”). Well, we have another tune that belongs in this exclusive category, and it comes from long-time touring drummer Jason Bemis Lawrence and his second single. Yes, “Southern Midwest” is just the second song he’s ever released (the first, “How Fast Can You Pack?”, featured the great Heather Woods Broderick). Just sit back and listen to this song without any interruption, and you’ll experience all three parts of the day. The intro is like a beautiful morning, where the sun’s first rays bask upon your face and invigorate you. The gorgeous piano-driven melody and Lawrence’s radiant vocals do the heavy lifting. As the song builds, it reaches multiple crescendos, reflecting all the wonderful moments and little triumphs that fill the main part of the day. Then there is the gentle ending, which is like watching a gorgeous sun set with the love of your life. It’s beautiful and a memory to behold if not to last a lifetime. This song, though, must be heard a second time for Lawrence’s moving lyrics. He tells the tale of a person wanting to break free and unleash his true self to the world. Of a man not wishing to be like everyone else, idling sitting by and watching the time tick away. Simply a wonderful piece of art. Lawrence’s debut album, Another Hotel Hallway, is out September 7th. It was co-produced with Anthony LaMarca of The War On Drugs. If you have a disco ball or even a flashlight, turn it on because it’s the perfect effect for “Baby Blue”, the mesmerizing electro-disco pop tune from Toronto’s Katie McBride. 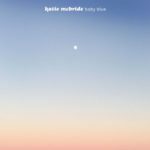 Reminiscent of Young Galaxy’s and Austra’s early works, the song is minimalist by electronic standards, yet McBride’s expertly crafts a soundscape that simultaneously feels as intimate as the bedroom yet as vibrant as one of Montreal’s most popular nightclubs. Synths pop in the foreground while an electric drum beat bounces in the background. 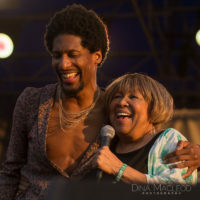 All the while McBride’s saccharine voice glides through the intoxicating atmosphere, reflecting on a life spent with one person. Although the music sends good vibes through your body, her words leave us contemplating moments when we were vulnerable yet still persevered. For a moment I thought it was you. Well I’m sure it was time so leave. The song is taken from McBride’s new EP, World of Dreams, which is out now. Pick it up on Bandcamp. The phrase, “buckle in because you’re about to go for a spin”, is often associated with driving, anthemic rockers. In the case of transcontinental trio The Pink Elephants‘ latest single, the statement applies but in much different ways. “Bubble Boy” is an intergalactic experience akin to the cosmic neo-psychedelia and post-rock of Spacemen 3 and Galaxie 500. It requires one to fasten their figurative seat belts in order to truly become lost within the stunning and heart-stopping soundscape. The spiraling guitars, searing synths, and ear-popping rhythms form the gorgeous interstellar environment, making us feel like we are inside Voyager 2 and traveling to the far reaches of our galaxy. Guiding us is Sophia Mammasi, whose vocals transcend the heaven and stars and come from somewhere distant, exotic, and breathtaking. Should NASA create another documentary or Ridley Scott produce the next movie in the Prometheus series, hopefully The Pink Elephants will score the soundtrack. The bands is comprised of Peter McNestry (guitar/synth/drums), Art Pegis (guitar/synth/vocals), and Sophia Mammasi (vocals). Their new EP, Interplanetary Reflections, is out August 20th. Pre-order it on Bandcamp.